VWO is the world’s first Connected Conversion Optimization Platform, and we are here to share 6 simple methods that are unique to VWO and would help you derive a winning conversion optimization formula. So without further ado, let’s begin. Please note that to implement all these methods, you require a trial account with VWO. Don’t have one? Sign up right now. User journey and conversion funnels are few of the best tools to analyze your visitor behavior and pinpoint the pages, and areas which are the main source of customer drop-offs. VWO provides one of the most precise depictions of user funnels with advanced segmentation options. Direct Traffic: The segment which consists of an audience that arrives directly to your target page by entering the URL or accessing it through a bookmark. Referral Traffic: The chunk of the audience that might click a referring URL from a website, a partner, or an affiliate. Social Traffic: Traffic that originates from social media channels like Facebook, Twitter, and Quora. New Visitors: Someone who has never been part of any test on a domain before. Returning: Someone who has been part of at least one test on the domain before. Paid Traffic Search: This type contains utm_medium query parameter such as cpc, ppc, and cpa to differentiate from other sources of traffic. VWO’s custom targeting allows you to focus on your ad campaigns by dynamically changing the landing page according to the PPC campaign clicked. For example, if you have a fashion ecommerce business promoting a bunch of black dresses with different ad copies. The ad group here would require a one-to-one, ad to the landing page, for a different pool of audience clicking the ads. Even with different ad copies, a marketer won’t be able to mitigate a many-to-one ad to landing page mechanism. But with the help of VWO, you can create a dynamic landing page and use your PPC’s unique parameters to match the ad group with the correct landing page. This happens because based on the query parameter of an ad, VWO can change the content of your landing pages dynamically. For Google AdWords, it is the globally unique tracking parameter called Google Click Identifier or GCLID. 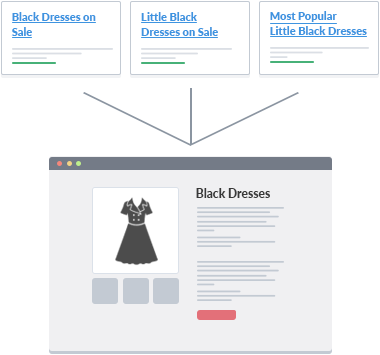 Learn more about how to personalize pages for PPC campaigns by reading this article. 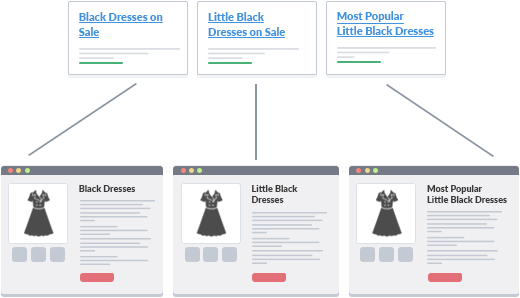 A similar approach, like the above, can be replicated for personalizing content on a certain page for various segments of your visitors. You can add unique query parameters to your website URL and personalize pages dynamically for a variety of audience. You need to add a customized query parameter at the end of the URLs you are targeting. For example, if one wants to change the content on a blog post for a given audience, they could assign the blog a query parameter like ‘yousite.com/blog/?=variation1’ where ‘variation 1’ is the parameter, VWO will recognize and change the content dynamically. With this capability, you can change all kinds of content on your website. It can vary from text, images to CSS and HTML properties. Visitor recordings are one of the most sought-after methods to understand customer drop-offs on your website. In live preview, you can figure out the major detractors for a customer or prospect at an individual level. For example, while going through live recordings, you find an anomaly that’s leading a customer to exit the website without taking the desired action. To mitigate this issue, a marketer or an analyst can ask the website IT team to make changes. This adds unnecessary steps to a problem that can be easily solved. A visitor can directly record observations by annotating information directly in the recording itself in VWO. Now your team can collectively view the issue and take corrective measures to improve its customer drop-off rates. For any type of web testing, when we are making a change to a universal element, the change should be consistent throughout your website. Even if it’s an AB test on a single page, changes made to universal elements have to be consistent. VWO identifies this pain point for a large set of its audience and provides an easy method to do so. Define a test page pattern. Make sure that the VWO code snippet is added to all these pages. Enter the test page pattern in the Run test on the URL field. The first wildcard (*) ensures that the test element is changed over both the http and https versions of your website. Please refer to this guide for in-depth information about replicating changes across your website. VWO is equipped with tools that allow you to back your conversion optimization program with data. Record your observations by using Analyze. A VWO user can record observations directly from heatmaps, click maps, and click area. Create hypotheses with the help of these observations. After collecting your well-researched observations, organize and use these to create hypotheses. Ease: On a scale of 1 to 5 (1 being the most difficult, and 5 being the easiest), select the complexity of the hypothesis. Rate how difficult it’ll be to implement the changes identified in the hypothesis. VWO leverages Kanban boards so that you can always keep track of your hypotheses in a pipeline format. Apart from that, you can assign each hypothesis a predictive impact score and prioritize it accordingly. There are a lot of ways in which VWO can improve your conversions. And these methods take minutes to implement on your websites. If you are already using VWO for optimizing your website conversion, we’d love to know your favorite. You can leave a comment below, and we’ll get back to you as soon as possible. The post 6 Advanced Methods To Understand Your Audience And Improve Conversions Using VWO appeared first on Blog.